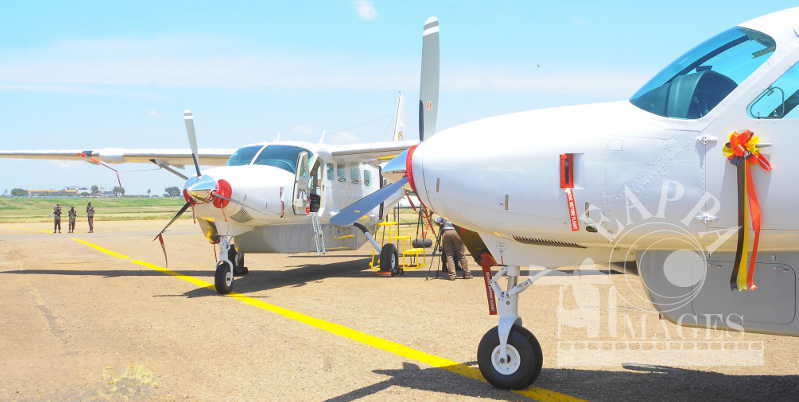 The decision by the United States to maintain its fourth largest mission on the African continent in Uganda, is one of the signs that the world’s biggest economy attaches great importance to Uganda, Americans are keen to point out. According to Dan Travis, the Spokesperson of the US embassy in Kampala, the American government employs more staff in Kampala than in Rome, Seoul, or Tokyo. It therefore comes as further encouragement, perhaps, that the United States is looking at growing its relationship with Uganda. However, while a number of Ugandans are appreciative of America’s contribution, they note that Uganda’s partnership with the US is taking too long to bring the desired change they seek including in building democracy, stronger and more resilient health systems and agriculture which supports majority of the population. 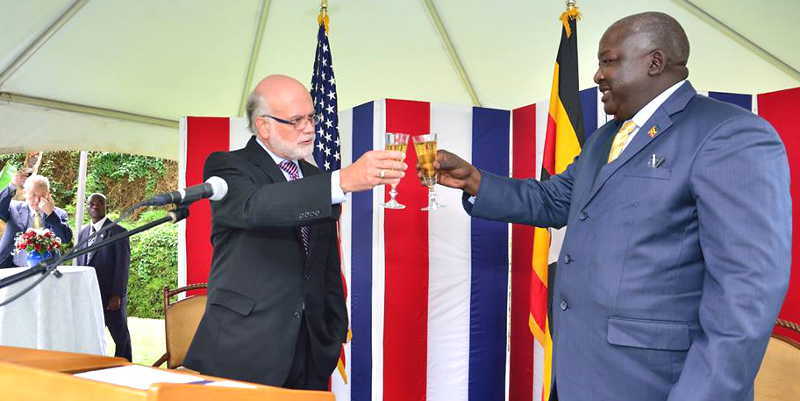 At a reception held to mark the 239th Anniversary of America’s independence, the US Ambassador to Uganda Scott DeLisi, pointed out that his country looks forward to strengthening its already strong relationship with Uganda. “As I prepare to leave Uganda in the next few months, I know that by building upon our shared beliefs we have managed to overcome differences and build a stronger partnership than ever before. My hope is that we can build upon what we have already achieved an even more strategic, more robust and more effective partnership in the years ahead,” said Ambassador DeLisi. DeLisi explained that America’s continued commitment to invest in Uganda is derived from the conviction that a free, more equal and more prosperous Uganda is in the best interests of the United States. Uganda’s Acting Foreign Affairs Minister Henry Okello Oryem acknowledged America’s contribution to Uganda including Budget support. The United States support to Uganda extends beyond its support to the Uganda People’s Defence Forces (UPDF) in fighting terrorists at home and outside Uganda’s borders including in Somalia. The US has been UPDF’s biggest funder in supporting the African Union Mission in Somalia (AMISOM). America has also for the last ten years been the largest supporter of Uganda’s HIV/AIDS response by funding over 80 percent of our Antiretroviral Programme. By prioritising health as their principal intervention, Americans say they have saved the lives of many Ugandans not only through provision of ARCs to 700,000 Ugandans, but also through other HIV/AIDS interventions such as supporting free Safe Male Circumcision to all adult males in Uganda as well as supporting safe deliveries among pregnant mothers in some hard to reach areas of Uganda. America’s HIV/Aids response, according to Ambassador DeLisi has cost their tax payers over US$ 2 billion (Approximately Ushs6 trillion) over the past ten years under their Presidents Emergency Plan For AIDS Relief (PEPFAR). And Ambassador Scott was keen to brag about the US allegedly being Uganda’s second largest employer, after government, by directly supporting the jobs of over 17,000 Ugandans. But this statistic remains unconfirmed and some people think MADIVAN or the telecom service provider MTN occupy the top employer positions. And perhaps for the first time, America’s Ambassador has officially acknowledged their support to Uganda’s political parties. The United States has made direct financial contributions to inter—party dialogues held over the past couple of years. But while Ambassador DeLisi emphasised their belief in equality for all people, a number of Ugandans detest America’s support to the promotion of practices such as homosexuality in Uganda. And while the US boasts of investing millions of dollars in healthcare systems strengthening in Uganda, a number of people are surprised the reported huge investments are having insignificant impact on improving healthcare management in Uganda. Other Ugandans have also expressed dissatisfaction about the fact that the US’s support towards critical sectors to Uganda’s economy such as Agriculture is not having broad impact despite billions of shillings that are reportedly being invested into the sector. Felix Kyeyune, a resident of Konge in Makindye Division argues that America would do better by prioritizing the Agricultural sector because it supports the biggest number of people. Under the Feed the Future (FTF) Programme, the US government under its USAID programme, allocated some US$150m to Uganda to implement the FTF programme between 2011 and 2016. American officials however blame Uganda government policies towards the sector, including its taxes on inputs, seed monitoring and regulation and access to markets as stumbling blocks to the success of their programmes are well as other initiatives in the agricultural sector. There is growing acknowledgement within Uganda that international aid including bilateral aid programmes such as the US support to Uganda cannot on its own bring about sustainable change without the determination of the people themselves and the leadership to bring about the desired change. An earlier version of this article had stated that US mission in Kampala is the biggest in East Africa in terms of workforce. We have since learned that the US embassy in Nairobi is bigger, but also that the US mission in Kampala is fourth largest in Africa in terms of staff employed.